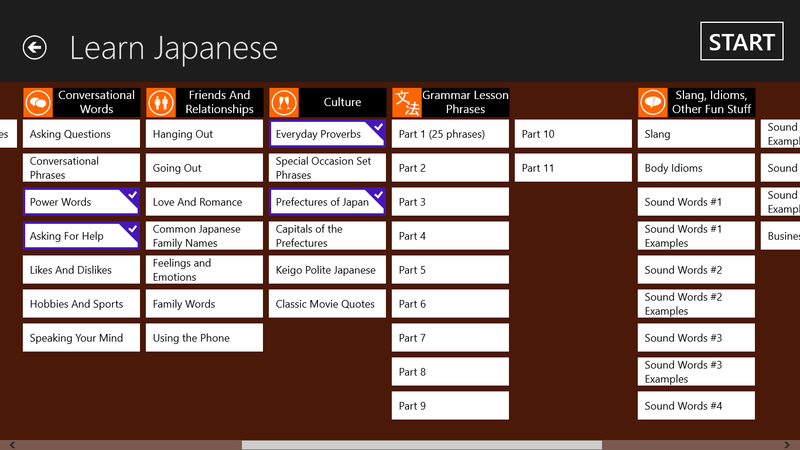 We are pleased to announce our Windows 8 app, Learn Japanese, has reached over a 1000 downloads! I am *very* pleased with this product. Grammar/kana lessons are reasonably good compared to popular textbooks. 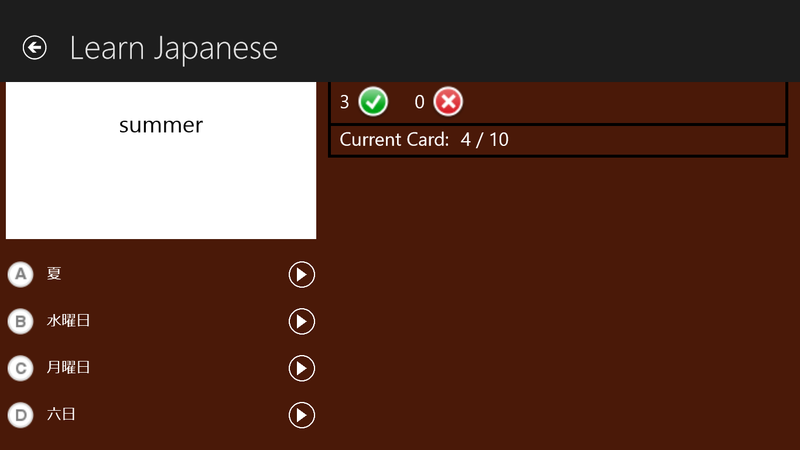 The advantage of this app is that it gives you immediate access to natural *native* speech (you can simply click on any Japanese sentence to hear it pronounced by a Japanese), an option that is often missing in textbooks *(if they come with CDS, finding relevant sentences is often impractical). I highly recommend this app, in addition to the JLPT apps by the same publisher. Thank you Mike–I’m glad it is helpful. If you have Windows 8 on your PC, download it today–there is a free version that is fully functional, but has (unobtrusive) ads and limited content. Click here. If you have a PC with Windows 8 installed, check out our brand new apps for the new operating system. Hiragana and Katakana – FREE – Covers all you need to know to learn both Hiragana and Katakana, the basics of Japanese writing and reading. Includes hundreds of sound files and mnemonic memory hints. It’s FREE and the ads really aren’t that intrusive–give it a try and PLEASE rate it after using it. Japanese Language Proficiency Test N5 Vocabulary – $2.99 – Learn all the vocabulary words needed to pass level N5 of the JLPT. But even if you are not interested in taking the test, these words and example sentences will be very helpful for the beginner of Japanese. 1,400+ sound files included. Japanese Language Proficiency Test N4 Vocabulary – $2.99 – The N4 level is for upper beginners and adds another 600 important words for the beginner to know. This app includes over 1,200 audio files (each word plus an example sentences to show usage in context). 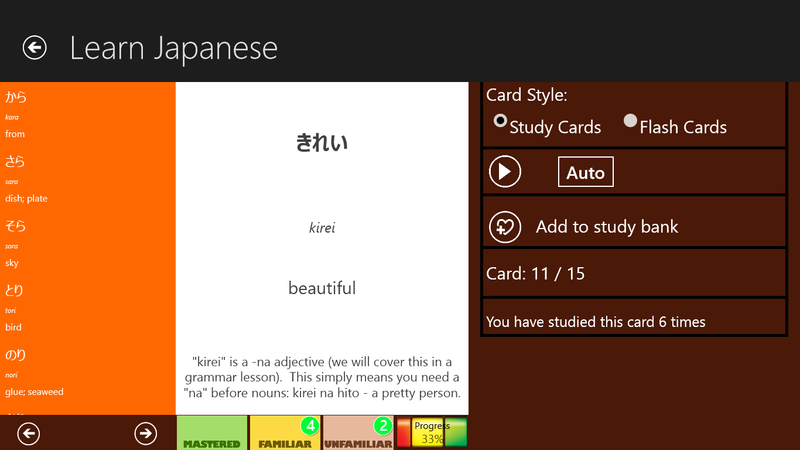 I picked up this app to brush up on my Japanese and it is very well put together. I’m impressed at the resources made available through this app. 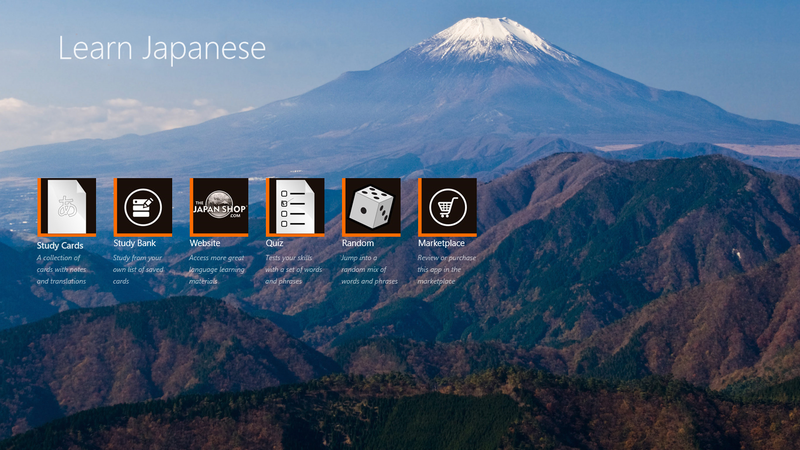 Love this on Windows 8, purchased it for preparation of Japan trip. Very pleased with the content and interface. A very nice beginner course in Japanese. Easy to follow lessons. I highly recommend this app! 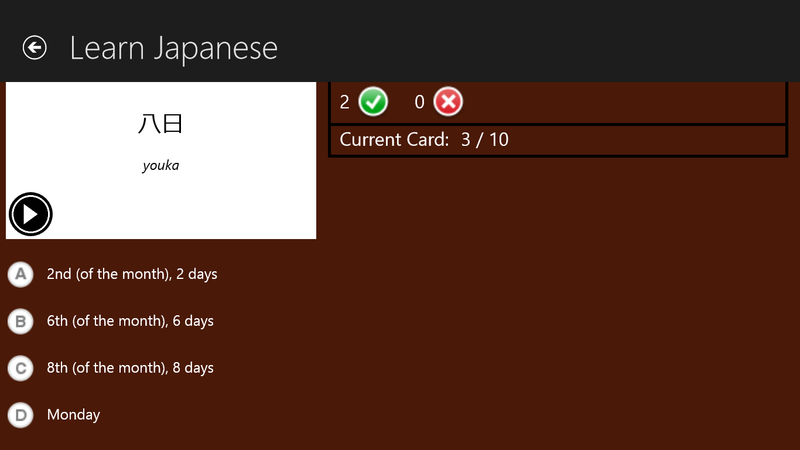 I’m new to learning Japanese, but this app is great for boosting my vocabulary!